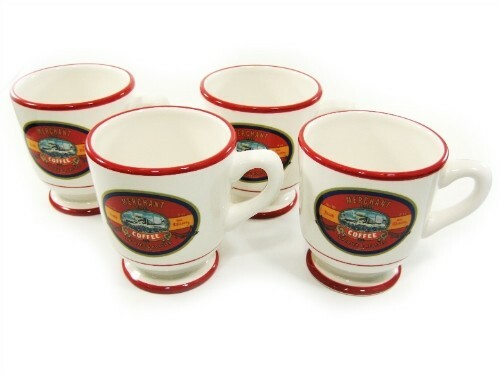 These vintage inspired mugs celebrate the vibrant culinary heritage of New Orleans, whos local cuisine reflects a delcious diversity of signature foods and table traditions. Immortalizing iconic elements of a classic southern breakfast, the colorful designs are based on early 20th century food labels from the historic New Orleans collection. Dedicated to the study and preservation of the region's unique history and culture. These 4 durable earthenware mugs are sized for hearty portions of your favorite breakfast beverages - from rich dark coffee and cafe au lait to hot chocolate or tea. From the 2007 collection. Dishwasher safe and microwavable. These coffee cups/mugs are like-new in the original box.